Veggie Egg Muffins are a make-ahead, freezer-friendly recipe perfect for breakfast on rushed mornings and your children’s lunchbox. Easy, healthy, and totally customizable to your family’s preferences! Egg muffins, egg cups, mini egg frittatas — whatever you call them they are a nutritious and delicious breakfast or lunch choice. 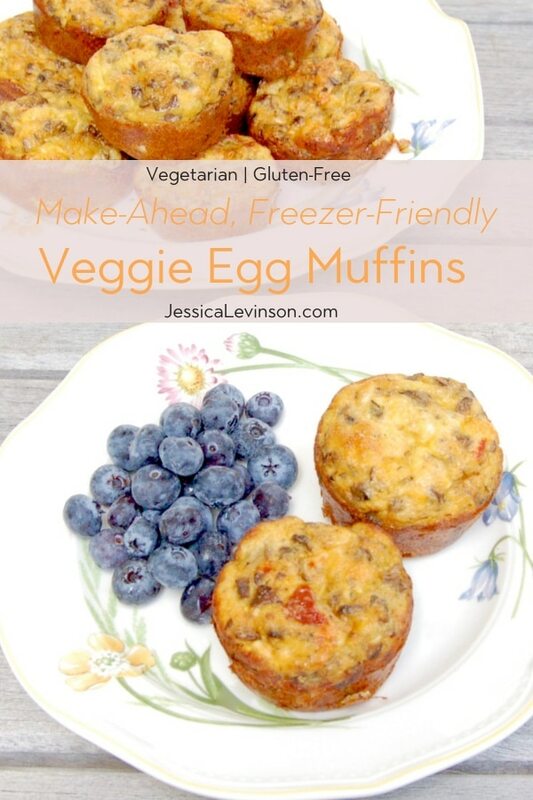 While you can find a lot of egg muffin recipes online, these make-ahead, freezer-friendly Veggie Egg Muffins are my go-to recipe, one I make every couple of months so that I always have a batch in my freezer. If your house is anything like mine, there’s no time to stand over the stove making eggs on weekdays. Most mornings the girls and I have some combination of cottage cheese, kefir, yogurt, cereal, oatmeal and fruit. The key to getting us out the door and to school on time is making sure we have these quick, easy, and healthy options on hand at all times. There are mornings though when we just don’t have our act together, and on those mornings there’s no time to sit down to a bowl of anything. That’s where these Veggie Egg Muffins come into play. 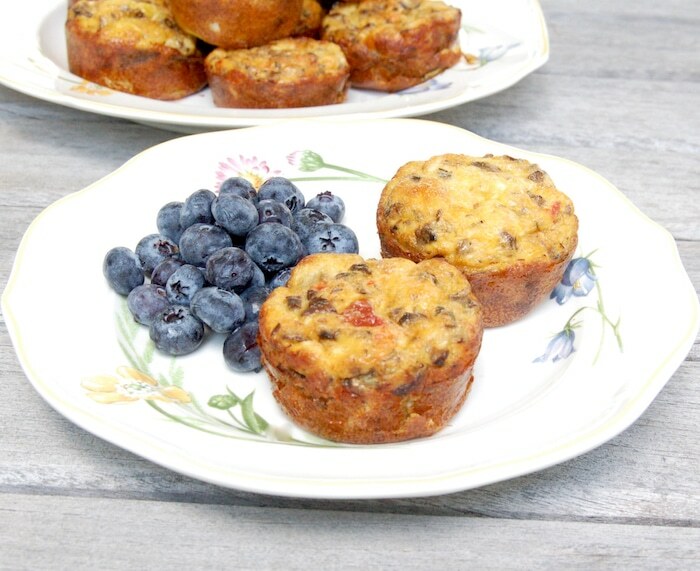 Like with my Ricotta Berry Oatmeal Cups, I always have a batch of these egg muffins in the freezer, ready to be quickly heated in the microwave and tossed in a reusable plastic bowl with some fruit for easy on-the-go enjoyment as we rush out the door. While I don’t generally condone eating in the car or on the run, skipping breakfast is not an option. (Check out my post The Benefits of Breakfast to find out why.) The thing is, the majority of on-the-go breakfast options aren’t the most nutritionally balanced and are often filled with added sugar. That’s why I like having my own homemade healthy options at the ready. 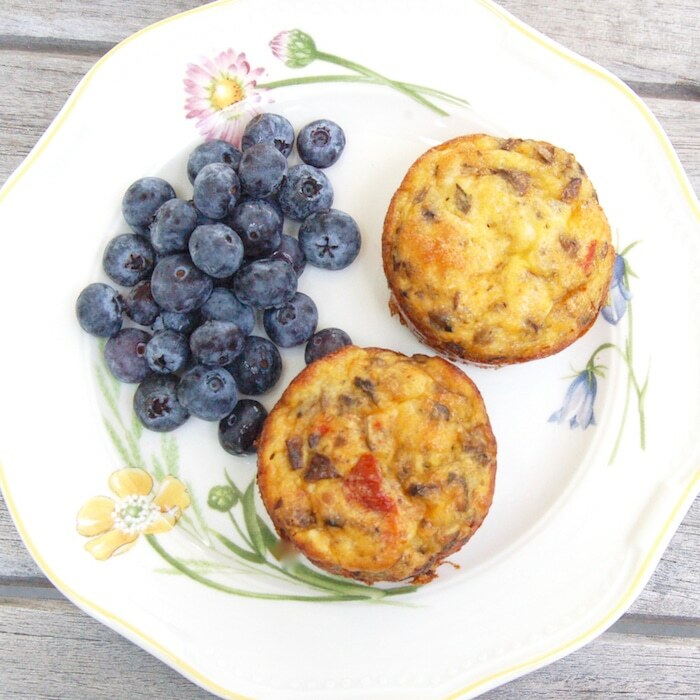 Breakfast on the run isn’t all these Veggie Egg Muffins are good for – they’re also perfect for the lunchbox! When paired with some fresh vegetables and fruit you have a well-balanced meal that the kids love. One of the best things about these Veggie Egg Muffins is how customizable they are for your own individual family. The recipe below, which includes mushrooms, peppers, and onions, is really just a guide to help you get started. 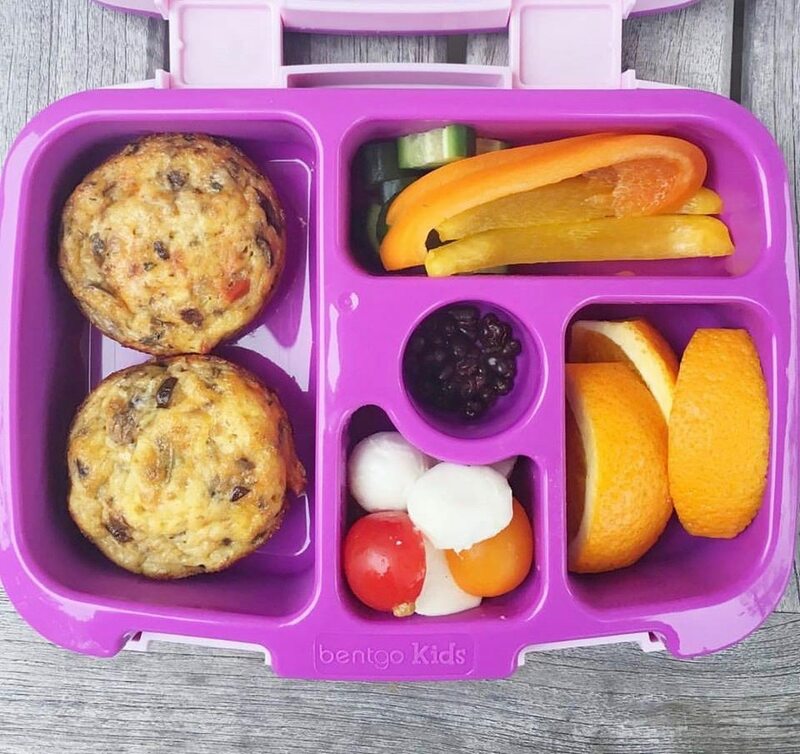 I love making these egg muffins with different vegetables, herbs, and cheeses depending on what I have on hand in my fridge and freezer, what my girls’ latest vegetable preference is, and what mood I’m in when I make them. Almost all of these varieties are vegetarian, nut-free, and gluten-free. While I include cheese in all of my egg muffins (these days, one of my girls only likes super cheesy eggs), you can very easily leave it out if you need a dairy-free version. Same goes with the little bit of milk or half and half included in the recipe. You really won’t miss much by leaving it out. We keep kosher and breakfast is usually dairy in our house, which is why I don’t include any meats, but if you’re a meat lover, feel free to add some in for a protein boost. I make my Veggie Egg Muffins in a very similar way as I make my egg frittatas – basically these muffins are just a miniature version of the larger full size frittata. It’s a simple 6 step process. Sauté the vegetables and deglaze the pan if necessary (which it usually is, especially with mushrooms – check out my Baked Mushroom Leek Frittata post to learn more). Sprinkle cheese in the bottom of every muffin cup. Top cheese with sautéed vegetables. Whisk together eggs, half and half or milk (if using), salt and pepper. Add 1/4 cup of egg mixture to each muffin cup. Top each muffin cup with extra cheese if desired. You really can’t get easier than that! I provide quantities in the recipe below, but those are really just a guideline for the sake of sharing the recipe. You don’t need to be so precise with this kind of recipe, just keep in mind you don’t want to overstuff the muffin cups! I hope you enjoy these Veggie Egg Muffins as much as my family does and that they make your mornings and school lunch packing that much easier and stress-free! For more breakfast ideas for rushed mornings, check out these 40 Quick & Healthy Breakfast Recipes for Back to School. I always have a batch of these Veggie Egg Muffins in my freezer for rushed mornings or to pack in my girls' lunchboxes. The recipe is easy, healthy, and totally customizable to your family's taste preferences. Use the recipe below as a rough guide and inspiration for the veggies you want to include. Then make a batch and enjoy! Preheat oven to 350 degrees F. Grease cups of a 12-cup muffin tin with cooking spray and set aside. Heat oil in a large skillet over medium-high heat. Add onions and stir occasionally until translucent and starting to brown, about 2 to 3 minutes. Add mushrooms and stir with the onions. Continue cooking, stirring occasionally, until most of the water has been released from the mushrooms and they are tender, about 5 minutes. Add peppers, stir together with mushrooms and onions, and add 1 tablespoon of water to deglaze the pan. Cook vegetable mixture until peppers have softened, about 3 minutes more. Add thyme and stir for 30 seconds until fragrant. Remove pan from heat and set aside. In a medium mixing bowl, whisk together eggs, half & half or milk (if using), salt, and pepper, to taste. Divide cheese, vegetables, and eggs evenly among muffin cups starting with cheese on the bottom (about 1 tablespoon for each), followed by the vegetable mixture, and finally the egg mixture (about 1/4 cup for each). Sprinkle extra cheese on top of each muffin cup if desired. 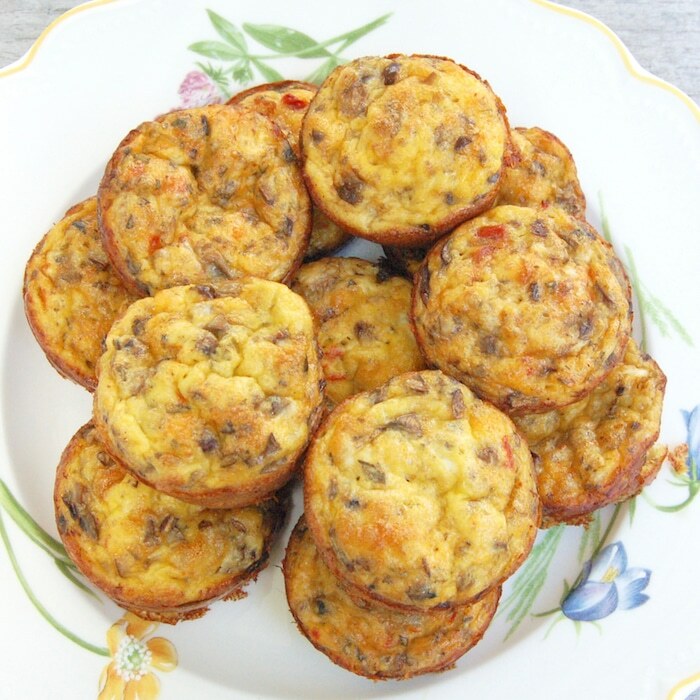 Bake egg muffins for 25 to 30 minutes until eggs are set and muffins are slightly brown on top. Remove from the oven and let cool about 5 minutes before removing egg muffins from tin. Serve immediately or cool completely before refrigerating or freezing. To make dairy-free, use dairy-free milk and cheese or leave them out of the recipe. What egg muffin pairing would you choose? Totally agree Kaleigh! Thanks! Can’t wait to try your version! So easy we usually do spinach and veggies. I never thought about sending them to school with the girls, I’ll have to try that! Although my oldest might not be a fan as she took hardboiled eggs once but the smell never again will she. Let me know if you try sending them to school – they don’t smell nearly as much as hard boiled eggs!! These are a great make-ahead recipe to keep on hand for a healthy breakfast as I’m running out the door! Love how they’re customizable for variety every time! Thanks Taylor – hope you love them! And yes, the customization factor is the best part! These will be perfect for me and my girls!! Those busy mornings will be more blissful with these on hand. Just printed and pinned the recipe. I think you and the girls will love them Lauren and I know you will love the more relaxed mornings too. Thanks for sharing and let me know how they go over in your house! So glad to hear you love them too Emily! And great point about using what’s about to go bad! I love the idea of egg muffins! I need to make a few batches and throw them in the freezer! Anything that you can customize is a win! Thanks Meg! They are a staple in my house. Hope you get a chance to make some and freeze! I adore eggs these way Jessica! Love all of your fun combos too! Thanks Sara! Hope you give them a try! I just whipped up a batch of these for my 1 year old – they look and smell amazing! Wondering if you have any tips on freezing these? Saran Wrap vs individual containers? Thanks! That’s great! So happy to hear. Hope they were a hit. For freezing I usually put them in a ziploc bag side by side – don’t stack them – and then freeze them flat. Once frozen you can reorganize them so the bag fits better in your freezer. Let me know if that works!